It’s always worse than we thought, and there’s a sound scientific reason for it too. It has to do with measurement precision (or parameter fitting if you’d like). First, what do I mean by “worse than we thought”? Just the familiar refrain in the popular press, the steady drum-beat of stories about how scientists thought things were bad, but this latest research shows it’s really bad. The latest research gets its own little press release or mention in the popular science news and then is quickly forgotten. Because it was, like most research, just an incremental improvement on our understanding rather than an earth shattering discovery. In fact, earth shattering discoveries generally don’t get good press (maybe they will in our modern, networked age, but we just haven’t had any yet so we don’t know). Google really is great for getting a feel for this sort of phenomena; click on the graph to go to the Google News Archive results for “climate change it’s worse than we thought” between 1960 and 2009. To go by the news archive, apparently 2008 and 2009 were slightly less worse than we thought, or perhaps 2007 was an abnormally worse-than-we-thought year. If you are a thoughtful citizen, trying to be well-informed, then you might be forgiven for thinking that we’re all about to stew in our own juices or be run over by category 6 super-storms any minute. The steady worse-than-we-thought rhythm of the popular press would mark the time in your attempts to stay informed and engaged. This is actually a topic covered fairly well over on RealClimate (their stealth advocacy is disturbing at times, but they do talk sense on occasion). When those reporters writing those news stories represented in the archive write the ’worse than we thought’ copy, they are not lying. So what is going on? This is where measurement precision comes in. Each individual piece of research is usually focused on one method or technique for measuring or estimating a quantity (whether it is arctic sea ice extent, global mean surface temperature, the cost of climate change on cotton in Calcutta, etc.). 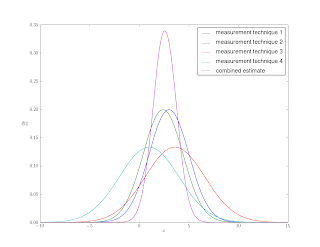 The precision of that individual technique is usually not that good on its own, so you get pretty broad probability distributions for your estimates of the thing you are trying to measure. This leads to the sorts of claims like, “new research gives much more credence to huge climate sensitivity to CO2 emission.” These claims are not mistaken on their own, but the proper way to evaluate them is in the context of all the other ways we have of measuring that same thing. Figure 2 shows a couple “measurement” distributions with large spread (or entropy) along with a distribution you’d get from combining them (assuming they were independent measurements). Notice that the combined estimate gives much lower probability to extremes that many of the individual estimates give a fairly significant probability. James Annan has done some work on exactly that sort of “evaluation in context” for climate sensitivity to a doubling of CO2. This post over on the AirVent is sort of similar, in that it tries to combine satellite and surface station temperature data into a single “picture” of what’s going on. Unfortunately in the climate policy debate what many alarmists (some might call them believers) claim as the weight of scientific evidence is actually just their prior inclination towards a certain way of thinking, fed by the popular press coverage of the issue, and what many deniers claim is the overwhelming weight of scientific chicanery is actually much the same thing. Jaynes understood this effect in terms of people being approximately Bayesian in their belief updating. Jaynes claimed that the way to combat a divergence of views was to be as open and transparent with methods, process and data as possible (and he claimed science had this sort of approach built-in, hence the ability of scientist to come to consensus more quickly than the public). Jeff Id puts it well, “The correct way to talk to a skeptic is to EXPLAIN YOUR POSITION AND GIVE CLEAR ANSWERS. Thats it.” I think Jaynes, and most reasonable folks, would agree. But in my opinion, it’s the criticisms that sound like calls to self censorship that foster skepticism and not Roger’s questions. Smart observation, but I'd say 'divergence' rather than 'skepticism'. ...they [Real Climate] do talk sense on occasion. Unfortunately, on other occasions they are just a propaganda rag. There are no Americans in the airport. # How can scientists and the media work together to present a more accurate picture of the changing Earth system? # How can scientists help the media ferret good information and diagnose misinformation and errors? # How can the media better discern and educate the public in what is Hollywood-type hysteria-for-entertainment versus legitimate science-based concern about hazards, disasters, and dangerous trends in the changing Earth system? # How can the science-media-public information system avoiding again sinking into the pit where every newly reported hazard or impending Earth change is necessarily a disaster so much better and bigger than the last one that was reported? # How can we help the public understand what is real from what is fabrications for entertainment's sake or political gains? The people who created and executed this strategy included very few scientists (and certainly no military historians). In many ways, the politicians and PR groups that initiated action on global warming issues acted independently of scientists, and borrowed heavily from successful campaigns on other environmental issues for their key messaging and iconography. Their campaign began in earnest in 2005, after the deadline for the submission of papers to the IPCC’s report AR4 expired. Their strategy consisted of pushing reports of more alarming climate change than was likely to be considered by AR4 reviewers, and finding daily news reports that could be interpreted as supporting their position. The key message was that the consequences of global warming were going to be much worse than the IPCC predicted—the science was moving too fast and the IPCC could not keep up. The temperature was sure to be higher. Sea level rise was sure to be greater. Arctic ice melt was sure to be more catastrophic than the IPCC was prepared to project. This was a strategy they could maintain until 2013, when AR5 would peer-review their claims. Gelman's commentary on Freakonomics is germane to this issue as well (emphasis mine): Usually it makes sense to trust the experts--especially those that you personally know and trust--but not so much if you're writing a whole book full of counterintuitive examples. It's selection bias: people's most controversial statements are the most likely to be mistaken. If these statements never get checked, then you have little more than a set of press releases linked with engaging commentary. Freakonomics 2: What went wrong? RO: Okay but why don’t any of these accusations come from within the academic science world? MM: Well, there was a political correctness, basically, for lack of another word. They do all these studies — global warming impact on butterflies and frogs — then they go through and put in all the caveats in these peer-reviewed studies. “What would happen if the temperature degree would rise x in this number of years? Well this would affect butterflies in this way or this way.” So finally you have a paper that says global warming might do this and this if this and this occurs. But the media and the university will get the press release and they’ll turn it into “Global Warming Spells Doom for Frogs! Massive Effect on Butterflies by 2025!” But what I’m saying is that the scientists allow this through their silence. And they’ll allow these sorts of manipulations of their work. This applies, in my view, to the towering seas, storms, droughts and mass extinctions of popular climate catastrophism. Such entertaining visions owe less to scientific climatology than to eschatology, and that familiar sense that modernity and its wasteful comforts are bringing us closer to a biblical day of judgment. As that headline put it for Y2K, predictions of the end of the world are often intertwined with condemnations of human “folly, greed and denial.” Repent and recycle!